Here's one of the most adorable first baby Christmas ornaments from the Radko Little Gems collection! 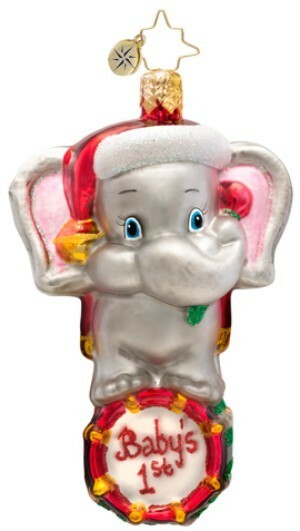 The celebratory sweetie gem Radko Christmas ornament features a big-eared baby pachyderm atop a barrel reading "Baby's 1st." It's a great first Christmas ornament for your child or grandchild and a memorable way to offer congratulations to friends. Crafted from premium European blown glass and painted by hand in every detail, the celebratory sweetie Radko Little Gem Christmas ornament delivers heirloom quality and a finish that will look fantastic for generations. Celebrate the first birthday or Christmas of a precious boy or girl this year with a wonderful addition to the Radko Little Gems collection, this 3.5-inch elephant that arrives in special Radko packaging at your option.